Namaste dear friends! This is my brief yoga-biografy. After I got a Master’s Degree in Philosophy at the Russian State University for the Humanities (Moscow), I started teaching yoga, visiting India and spending a lot of time there. My first yoga-teacher was Jayakumar Swamishri from Mysore. He taught in the tradition of Swami Kuvalayananda and Bangalore Yoga Institute (Vivekananda Yoga Kendra), giving classes at the Indian Embassy in Moscow for several years. I started my practice with him in 1995-96. At the late 90’s I also started practicing Ashtanga Vinyasa yoga with Russian teacher Igor Medvedev and visited workshops of Andrey Sidersky and Andrey Lappa, yoga teachers from Ukraine. My first trip to India was in 2001. There I practiced in Morarji Desai National Yoga Institute in Delhi (Dhirendra Brahmachari’s school) under the personal supervision of Bal Mukund Singh. 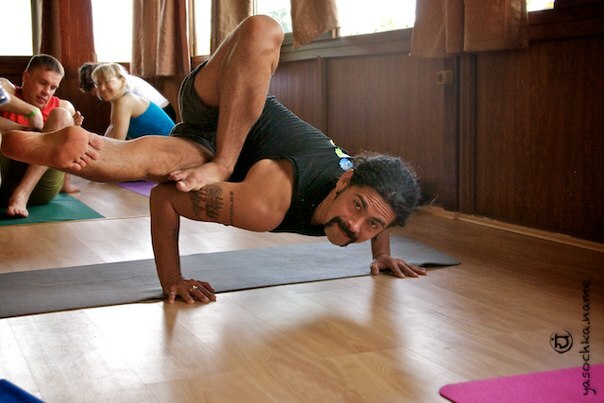 In the same year I continued the practice of Ashtanga Vinyasa yoga in Mysore with B.N.S. Iyengar (Bramatantra Parakala Mutt). It was in this hall on the second floor of Hayagriva Temple where Shri T. Krishnamacharya (BNS Iyengar’s teacher) taught in the 1930’s. I also practiced Ashtanga Vinyasa with V.Sheshadri (Mysore Mandala Yogashala). Since then I have been visiting India every year, spending several months there. In 2003 I started studying at Ashtanga Yoga Research Institute with Shri K. Patabhi Jois and R.Sharath. In addition to this, I attended the classes of Gopala Krishna in Bangalore, classes in ashrams of Rishikesh (Yoga Niketan Ashram) and Pondicherry (Swami Gitananda Ashram). I studied shatkarmas, pranayamas and meditation in the tradition of Sivananda Yoga with yogacharya Madhavan Munusamy (Vivekananda Yoga Therapy Institute, Tamil Nadu), who granted me a certificate in 2006. Аccomplished a teachers training course in Sivananda Yoga Ashram (2008, Neyar Dham, Kerala) and recieved spiritual name and mantra diksha (initiation) in Saraswati lineage. Also recieved diksha in Veera-Shaiva lingayat sampradaya (from Shri Chandrashekhara Mahaswamiji, Jangamvadi Math, Varanasi) and mantra-diksha in Datta sampradaya (from Swami Vettal, Karnataka). I have participated in the intensive training courses by Shandor Remete (“Shadow Yoga”, 1999), Kali Ray (“Tri Yoga”), Gabriella Giubilaro (Iyengar Yoga), David Swenson (accomplished a certification Ashtanga course with him in 2010), Mark and Joanne Darby (Canada), Andrey Lappa (teacher training course in 2004, “Universal Yoga”, intermediate level), Simon Borg-Olivier («Yoga Synergy», Australia). I am familiar with Tibetan styles of asana practice (Yantra Yoga in the tradition of Namkhai Norbu Rinpoche, taught by Fabio Andrico; Trul Khor in the tradition of Yundrung Bon, taught by Tenzin Wangyal Rinpoche). Have experience in practices of Vajrayana (Tibetan Buddhism) of Nyingma, Kagyu and Dzogchen schools and Yundrung Bon. Did vipassana meditation retreats in S.Goenka lineage (Myanma tradition) and in Doi Sutep monastery in Ciang Mai (Thai tradition). In 2016 completed Vinyasa Krama Yoga TTC with Shrivatsa Ramaswami — direct disciple of Shri T. Krishnamacharya (who studied with Krishnamacharya in Madras in 1955-1988). Kriya Yoga of Lahiri Mahasai. Since 2005 I am practicing original kriya yoga in the tradition of Lahiri Mahasai (taught by Shri Shailendra Sharma, Govardhan). This is practical sequence of pranayam, bandhas and mudras (including complete khechari mudra) transmitted by lineage: Babaji-Shyamacharan Lahiri Mahasaya — his son and disciple Teenkori Lahiri Mahasaya — his son and disciple Satyacharan Lahiri Mahasaya — Shailendra Sharma. There was no any simplifications made, unlike certain other lineages of Kriya yoga (there you could not find khechari mudra or kumbhakas, described in Lahiri Mahasai works). I accomplished David Frowley’s course “Yoga and Ayurveda” (American Institute of Vedic Studies), visited lections of ayurvedic doctors M.Mezentsev (Mathura Mandala dasa) and Andrey Golovinov (Kerala ayurvedic tradition). Completed course of traditional Thai massage school TMC (Chiang Mai, Thailand), Thai massage courses with Michael Buck (Mukti) in Florida, US and with Leila Gajinskaya (Mettaschool, Moscow). In 2014 completed craniosacral therapy (biodynamics) course with Rosemary Wallace (UK). Completed «Transpersonal Hypnotherapy» course (Age regression, In Utero regression, Past Life regression) with Paul Aurand (New York), Educational director of Newton Institute, in 2018. Member of Russian Association of professional past life regression therapysts. In 1999 I was one of the founders of Moscow Ashtanga Yoga Center and became one of its leading teachers. Since 2003 i`m teaching on Teachers Training courses in Russia. In 2003-2010 I was the deputy editor of the Moscow «Yoga Magazine» (first Russian printed yoga magazine, which was before US Yoga Journal coming to Russia, now closed). In 2011, together with Mikhail Baranov founded own Yoga108 center and Yoga108 TTC and Advanced TTC courses. Our center was Russian host of workshops with Danny Paradise, Doug Swenson and David Swenson, Madhavan Munusamy, Bal Mukund Singh, Simon Borg-Olivier, Mark and Joanne Darby, Michael Stewart, Anastasis Kotsogiannis, Anthony Grim Hall and many other amazing yogateachers. 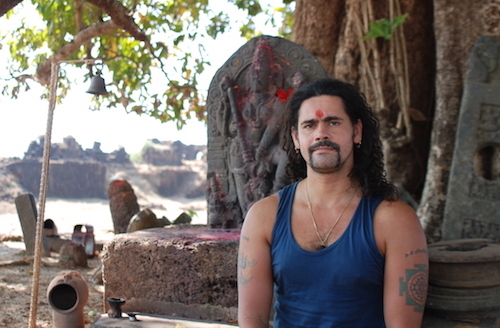 In 2010, together with Maxim Yasochka founded an online magazine Wild Yogi (Editor-in-Chief). In 2011, together with M. Baranov organized the International Yoga-Rainbow Festival. We successfully held for 13 International festivals in Turkey, India, Russia. Since 2011, our festivals attended by such masters as Mark and Joan Darby (Canada) Мadhavan Munusami (India), Simon Borg-Olivier (Australia), Anthony Grim Hall (UK), Boris and Reni Georgiev (Austria), Rakesh Pandey (India), Bal Mukund Singh (India), Swami Ashokananda Saraswati (USA), Michael Stewart (Mexico), Pau Castellsague(Catalonia), Petri Räisänen (Finland), Chris Chavez (USA & Turkey), Oleg Flow (USA), Dearbhla Kelly (USA), Brian Yuen & Lorrie Shepard (USA), Аndrew Eppler (USA), Anastasis Kotsogiannis (Greece), Elena Mouratidou (Greece), Cosmin Iancu (Spain) and many others as well as the most popular teachers of Yoga, Thai massage and Ayurveda from Russia, Ukraine and Kazakhstan. Also i`m guest teacher of Barcelona Yoga Conference, Ljubljana Yoga Conference (Slovenia), India Yoga Festival (Goa), «Yogasynergy school» (Miami, Florida), Teachers training cource of «The Yoga Shala» (Victoria, Canada). Now on my classes and workshops I teach in a style that we call Yoga108 — it includes methods of Indian schools: Sri T. Krishnamacharya, P.Jois, S.Ramaswamy, D.Brahmachari, Swami Sivananda, Swami Satyananda, and practices of the modern schools interesting to us, as Shadow Yoga of Shandor Remete, Yoga Synergy of Simon Borg-Oliver, etc. Classes may be held with method of some particular school, and in the «universal» style, which includes a considered combination of different approaches. Pranayama and meditation techniques of Raja Yoga I teach primarily in the tradition of Sivananda & Satyananda. Also I teach yogic techniques of deep relaxation, such as Yoga Nidra (Satyananda), Cyclic Meditation (Vivekananda Yoga Kendra, Bangalore). I conduct regression therapy sessions (Past Life Regression), often integrated with Yoga Nidra. I lecture on the Philosophy of yoga, traditional texts and spiritual systems of the East, the history of modern schools of Hatha yoga, and write articles on the above topics. My personal practice — hatha yoga, kriya yoga (original Lahiri Mahasaya method, with mudras, including khechary, pranayama and kumbhakas) and raja yoga.